Veterans For Peace, an organization of which I’ve been a member since 2013, has called for veterans (as well as civilians) affected by the Vietnam War to write a letter to the American war dead for this Memorial Day. This letter-writing effort is part of a campaign to counter the Pentagon’s effort to paint the Vietnam War in a “noble” light. The letters will be hand-delivered to the Vietnam War Memorial in Washington, DC on May 25th. This is my contribution. You came from small towns and big cities; you came from different socio-economic backgrounds (though tilted, of course, toward the lower end of the income spectrum); you came from different ethnic and religious heritages. Some of you enlisted enthusiastically, believing you were saving “The Free World” from a communist menace; many of you, like myself, enlisted in order to “beat the draft”; but undoubtedly the majority of you were conscripted: “Take this rifle, son, or…meet your cellmates for the next few years in this Federal Penitentiary.” A few of you were women, serving in a medical or perhaps clerical setting. Death, the Great Leveler, has here united you all. But Death is not the only thing that binds you together. You were all victims of a national sickness, a belief that the United States of America has a God-given mandate to rule the entire globe, to its own economic benefit. You were all victims of a chain of monstrous lies which led to your deployment to a strange land that most Americans didn’t know existed prior to the 1960s. The first of these was the fiction that there was a separate, sovereign nation called “The Republic of South Vietnam” that needed you to defend it against “aggression from the north.” Democrat, Republican, it mattered not: our national leaders lied to us again and again and perpetuated one of the most criminal wars of modern times. Not a single one of you should have been deployed to Vietnam in the first place. Not a single one! And thus, as surely as the uncounted millions of inhabitants of the region killed by US weaponry, each and every one of you is a victim of US military aggression. And no one in the leadership of the war machinery, at any level, has ever been prosecuted for their roles in this criminal undertaking. Not a single solitary one. If resurrected from the realm of the dead you could be, what would you make of the state of the world today? Sure, the advances in technology would wow you at first. Such wizardry! Hey, what became of the USSR? And is that a black man in the White House?!? That would be a shocker, no doubt. But after examining what is recent history for us in this present era, I hope you would be alarmed and ultimately outraged that American troops are still deployed all over the world in the effort to maintain economic hegemony, and that they kill and occasionally get killed or maimed…for what, exactly? To “defend freedom”? While our own dwindling freedom here at home is in mortal peril of being extinguished, in the name of “our own protection”! While the streets of our cities and towns are patrolled by cops wearing full combat gear, generously donated by the Pentagon. And that very Pentagon is spending millions of taxpayer dollars on a campaign to persuade the generations following ours that the war that took your lives was far, far from the monstrous crime that it was. I hope you would be sufficiently appalled that the USA learned not a damned thing from its defeat in Vietnam that you would be moved to actively resist current government policies. But that is a struggle we, the still living, will have to pursue. Continue to rest in peace, brothers and sisters. Your fighting days are over. ← On Memorial Day, Is There Room to Honor Former Enemies? I’ve visited a lot of war memorials, both in the USA and in England. Just about every English village I walked through had a monument to the dead in the “Great War” or “World War,” i.e. WW1, with more names often added at the bottom for World War II. Lots of cities and towns in the USA have a monument, often a large one, to the dead of the U.S. Civil War. And most of these monuments are very straightforward, featuring a soldier or figure of victory or consolation. 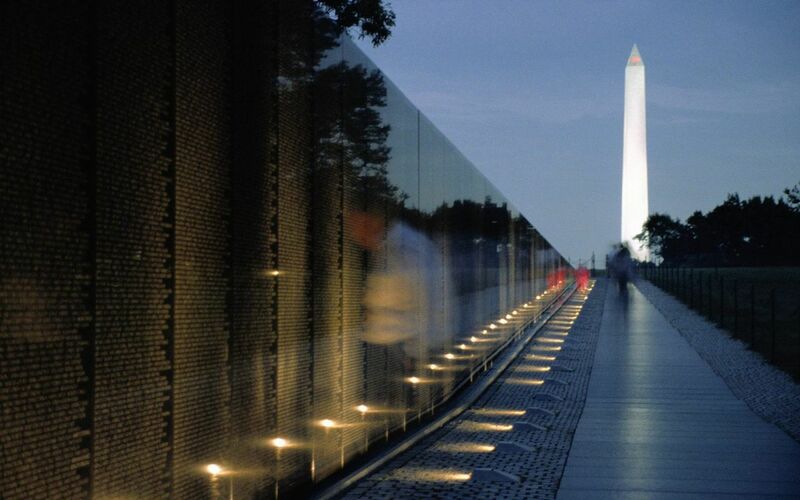 But the most moving, most powerful, monument I’ve ever visited is the Vietnam War Memorial in DC. I was serving in the military at the time, and when I came to The Wall, and all those names, I just felt a rush of sadness and grief. I choked up — What a waste, I thought. So many young lives snuffed out before their time. When will the madness of war end? Moving statements, but for me, there another matter that historians ought to address. The matter: how so many wars generate the grievances that lead to subsequent wars. ‘Making peace’ ought to be studied as throughly as making war. Yes, I agree. Much more effort has been dedicated to how to win wars (strategy, tactics, weaponry, leadership, etc.) than how to win (and keep) the peace. The natural tendency for a country that wins a war is to pursue a vindictive peace. Naturally, the loser vows revenge. And so the wars continue, generation after generation. And of course Congressman (now retired) Dennis Kucinich could gain no traction whatever when he proposed that the US government needs a new branch, to be called the Department of Peace. Greeted by a wall of silence was he, except for those who snickered aloud at the notion. Greg…Thank you for a thoughtful and beatiflully crafted statement. Young men fight the wars to cover the grievous errors of the old and rich men who send them off to die. I was once proud of my service in WW II but now feel that our victory in what was a necessary defensive effort has been used by those in power to justify their fascistic domestic and international goals of aggrandisement. So did Hitler, or so we are told. Just a symptom of one more disease? Tell me anyway — maybe I can find the truth by comparing the lies. Our planet is being turned into a filthy and evil smelling imperialist barrack. A comment by b. traven. Myron (Mike) Swack and I were raised in a Jewish orphan home. Mike was a year younger than I. I volunteered for the U.S. Army Air Corps cadet program and was accepted in early 1943. Mike volunteered for the army shortly after me but he was only 17 years old. While I was still in training in late 1944 Mike was sent into the Battle of the Bulge as an infantry replacement. His squad was surrounded in their foxholes in that ferocious winter battle. His squad was murdered when they tried to surrender to the Germans in the story he told after the war. His “dog tags” told the Germans that he was a Jew and they sent him to a concentration camp rather than POW camp as mandated by the Geneva Convention governing the treatment of POWs. In the camp he was tortured and only escaped as the Allied armies swept into Germany. I am sad on every Veteran’s Day. I remember being on the front line. I remember the high casualty rate. War is an ugly, ugly scene. It begins ugly and it gets worse. How cold my feet were. I remember being captured by the Germans. I remember being taken by cattle car to prison camp. I remember the hell of being a prisoner. Germany back to the American lines. I remember the ambulance and the hospital. I am very well read in Trotsky. His achievement may be unique in (modern, surely) history: with no military background himself, he was tasked with creating virtually from scratch a Red Army (and Navy). This organization successfully defended the young Soviet Union against the marauding forces of some 19 capitalist nations and internal enemies during the Civil War. Stalin’s rise to control brought changes, like expansion of privileges for commissioned officers and a more hardened bureaucratic structure, but this military nevertheless halted Hitler’s army in its tracks and chased it all the way back to Berlin. Trotsky was also a brilliant writer. All that being said, I mean to argue that “War” should not be treated as an inevitable result of human activity or some phenomenon of independent, eternal existence that dwells outside the realm of humans (the way the concept of “Evil” is sometimes treated). War was a terribly costly and painful necessity for the people of Vietnam. The alternative would have meant continuing to be treated as inferior beings on their own soil by colonial powers. Their war was a just one. Not so for the US invaders, regardless of the reluctance of many of those troops to be thrust into the situation. Allow me to repeat what I have stated previously in this forum: the US has not undertaken a military operation in my lifetime (i.e. post-World War II) that I can deem just. Returning to Trotsky: from his exile in Mexico he observed Europe marching inexorably toward World War II (for those not aware, Trotsky was assassinated in Mexico in 1940). He turned his gaze north and noted that the United States was the pre-eminent industrial, and potentially military, power on Earth. He made bold to declare nothing less than that the future of Humanity would be forged in the oven of the class struggle in the US. That is, if the working class could seize control of this productive might it could wield it in the interest of all, and a much better world would come into being. As we know, reality proved quite the opposite, as militant trade union leaders were tarred with the brush of “communist agents” after our World War II ally, the USSR, was utterly demonized. The American masses, with rare exception, swallowed this propaganda hook, line and sinker. And just look at the state of the world today! Trotsky did not mince words and he wasn’t afraid of ridicule. He declared that the future of Humankind, failing a successful rise to power of the working class, might entail a backsliding into barbarism. Barbarism. Ponder that for a while, folks. The window of opportunity for workers in America Trotsky refers to is permanently closed, I think, for too many reasons to try to list here. Perhaps at some point humans will evolve to live sustainably and harmoniously, hopes the optimist in me. Presently, though, this Emerson observation remains accurate: “I hate this shallow Americanism which hopes to get rich by credit, to get knowledge by raps on midnight tables, to learn the economy of the mind by phrenology, or skill without study, or mastery without apprenticeship” (Self-Reliance). And for that matter cheap grace. Whatever grace is or should be, it’s not granted cheaply.